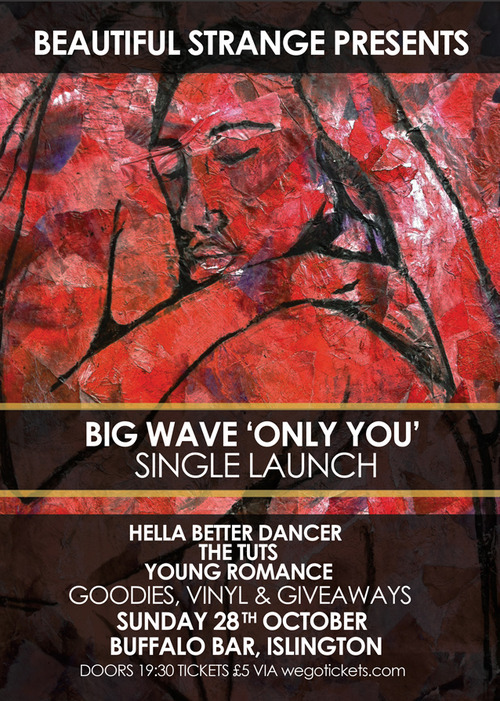 Beautiful Strange is delighted to host the single launch party for the debut vinyl release by Torquay five piece Big Wave, ‘Only You’. With all fingers crossed they’ll be advanced copies of the single on sale on the night (official release date is November 5th) and they’ll be give-aways throughout. The first 20 people through the doors on the night will receive a goody bag with a selection of nice things, vinyl, tapes, badges and more. Venue: The Buffalo Bar, 259 Upper Street, Islington, London, N1 (just outside Highbury & Islington tube station). Map. 17.00 - 22.00. Free Entry. Cafe open all day for food / drinks. Beautiful Strange hosts a free event held in the lovely, tranquil gardens of The Gallery Cafe (weather dependent - if wet we’ll move to the Cafe / St Margaret’s Chapel). Laid back with wonderful music and great drinks (whitstable ale highly recommended) the sun has promised to make its yearly showing. Starting around 5.00pm and running until approx 10.00pm. If you know me personally, this event will also double up as a little birthday soiree! Beautiful Strange is delighted to host the single launch for its latest release, the debut vinyl release from London five-piece Fountains ‘Easily Led’. Available to stream below and pre-order now via bandcamp http://beautifulstrange.bandcamp.com/ (and also on the night). Lost Left have a vast sound with shifting movements, resounding guitars and an other wordly sense in the lyrics, that hints towards, if anyone, Lift To Experience or perhaps British Sea Power. Live, the band has grown a reputation for a heavy driven sound and unexpected turns. Venue: The Old Queen’s Head, 44 Essex Road, Islington, London, N1 8LN - details / map can be found here. Press requests / further information email. Beautiful Strange is delighted to host an Indietracks warm-up show for three bands who’ll be heading off to play the finest indie-pop festival in the UK, held at The Midland Railway Centre in Derbyshire, the following weekend. This show will held at the legendary George Tavern on Commercial Road and entry will be £4 in advance. Full details below. Tender Trap is Katrina Dixon, Rob Pursey, Emily Bennett, Amelia Fletcher, and John Stanley. Between them they have played in Heavenly, Betty and the Werewolves, Policecat, Talulah Gosh, Sportique, Dweeb, Marine Research, Sally Skull, and probably some more we have forgotten. September Girls are a five piece girl group, playing fuzzy and reverb-soaked garage pop with heaps of harmonies. September Girls have been described as “radiant noise pop of the finest order, guitars distorted, verses simple and catchy, drums energetic, it sure is sweet on the ears”. Simon Nelson and Alice Hubley met on the London Underground after a Stereo Totale gig in 2009. Two days later Simon was round Alice’s house unblocking her kitchen drain. Since then Simon has been round and put up two curtain rails, a blind and a shelf in exchange for badly cooked pasta and pear cider. When they are not doing DIY they like to talk Beach Boys, analogue synths and procrastination techniques and occasionally play music together abley assisted by Dan Chapman and The Late Jonny Tansey. You may recognise Cosines from such other bands as Arthur and Martha, Vermont, The Loves, Brother Francisco, The Duloks and One Fathom Down, maybe. Venue: The George Tavern, 373 Commercial Road, London, E1 0LA. Map. After the huge success of the debut night hosted in St Margaret’s Chapel in early May Beautiful Strange is delighted to announce the next gig in the beautiful, intimate surroundings of the chapel room which will be headlined by the a solo acoustic show by the incredible Shura on Wednesday June 13th. As ever, The Gallery Cafe will be open and serving coffee/dinner/cake/wine/beer throughout. The Cafe has a great promotion at the minute too, a free glass of wine with any meal after 6pm (headhere for more on that) and drinks can be brought through to the chapel. The last chapel show sold out so if you want to come, advance tickets are advised. Worry Dolls won’t sing about love. Not directly, at least. In all of their songs the ‘l’ word is mentioned only once, and hardly in a positive context. It’s their small statement against a worn down lyrical standard that is too often relied on when a writer has nothing new to say. It doesn’t need to be groundbreaking, and it doesn’t need to be important (on ‘Oliver’ Rosie and Zoe sing about an infatuation with a West End drag queen), but it needs to be original, and it needs to have meaning. At least, that’s how the Worry Dolls both see it. And if they agree on that, it must be true. Evans the Death, who have just released their critically acclaimed debut album on Fortuna POP! and Slumberland records, make frenetic and infectious punk pop which exudes the kind of unbridled charisma, intelligence, and runaway energy that promises a singularly exciting future for the band. Comprising Dan Moss (guitar, vocals), Olly Moss (guitar), Katherine Whitaker (vocals, keys), Rob Mitson (drums), and Lan McArdle (bass), and named after the undertaker in Dylan Thomas’s Under Milk Wood, Evans the Death are poised to fulfill their potential as one of the most refreshing and exhilarating new groups around. Venue: The Old Queen’s Head, 44 Essex Road, Islington, London, N1 8LN - details / map can be found here. Cafe open all day for food and drinks. Ellie Rumbold is serious teenage musician from London who has been playing music for almost her entire life. She says she ‘dabbles’ at some guitar here and there… and ‘sings occasionally too’, along with excessive tea drinking. I think she’s quite incredible and can’t wait to have her down to play. Doors 19:30. Tickets £3.00 in advance. Beautiful Strange is delighted to announce it is to host a series of special, intimate gigs in the stunning chapel room of The Gallery Cafe (a vegan/vegetarian cafe on Old Ford Road, Bethnal Green which will be open and serving coffee/dinner/cake/wine/beer throughout.) These evening will be completely unplugged and acoustic, the chapel (pictured below) at the back of St Margaret’s House (entry through the gallery cafe) will hopefully provide the platform for the sort of experience that makes live music so fulfilling. It is with great pleasure to announce This is the Kit will headline the first of these nights on Friday 4th May. This Is The Kit is the musical project of Kate Stables and friends. You thought you didn’t like the banjo but you were wrong pal. Listen as Kate rips forward with her hypnotic twang pattern and a voice of rare, unaffected beauty. Eliza Shaddad is a Scottish and Sudanese singer-songwriter with a musical background as diverse as her heritage. An eclectic array of influences – from childhood days spent at English folk festivals to the underground Hip Hop scene during her teens to more recent postgraduate jazz studies at the Guildhall – have worked to create both a composer and performer of remarkable and moving ability; blending intricate guitar patters with a stunningly forthright voice.